Wand-Lighting Charm is the very first spell you will learn in year one chapter two from professor Flitwick. Lumos is the easiest spell you will learn but nevertheless, it's the most used one. Before you can cast your first spell you will need to learn more about it. Pay attention to the class! Professor Flitwick will ask you a question regarding the Lumos spell. Afterward, with a bit more studying and practicing, you will be ready to try and cast Lumos. Now all you need to do is to swing your wand in the right way. If done correctly, the tip of your wand will start to light up. Lumos is mostly used to search shadowy rooms for hidden dangers, revealing secret passages that can’t be seen by bare eyes or just to help you with your reading in the dark and light up your newspapers. It may look like its just lighting up the tip of the wand but it actually provides a strong concentrated beam that can repel creatures such as Ghosts or Gytrashes. Upon learning Wand-Lighting Charm you will be granted +5 Gems. 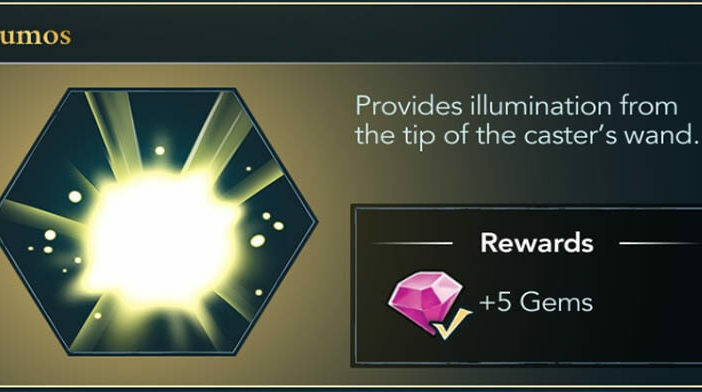 You can spend Gems on many features in the Harry Potter: Hogwarts Mystery game. Even the great Harry Potter used Lumos in his adventures like the time when he was with Albus Dumbledore when they were on a quest searching for the Horcrux locket in the dark crystal cave.